NEW YORK (CNS) — A front-page New York Times article published July 16 detailed the alleged abuse of two seminarians in the Diocese of Metuchen, New Jersey, by then-Bishop Theodore E. McCarrick in the 1980s that resulted in settlements to each man. The alleged abuse of these two men, according to an interview with one of former priests by the Times and the examination of the second man’s file by the newspaper on the condition that he — now also a former priest — not be named, took place in the 1980s, while Bishop McCarrick served as first bishop of Metuchen and then as archbishop of Newark, New Jersey. Ordained a priest for the New York Archdiocese in 1958, then-Father McCarrick was ordained an auxiliary bishop of New York in 1977. He was appointed the first bishop of Metuchen in 1981 and was named archbishop of Newark in 1986. He was installed as archbishop of Washington in 2001 and made a cardinal in that same year. He retired in 2006. The Washington Archdiocese said in a statement on the matter that “the Holy See … has exclusive authority in the oversight of a cardinal” and referred the matter to the New York Archdiocese. New York Cardinal Timothy M. Dolan, also in a June 20 statement, said the allegation was turned over to law enforcement officials, and was then thoroughly investigated by an independent forensic agency, as per the “Charter for the Protection of Children and Young People” first approved by the U.S. bishops in 2002. “The Holy See was alerted as well, and encouraged us to continue the process,” he added. The Archdiocese of New York “renews its apology to all victims abused by priests,” he added. In the July 16 Times story, Robert Ciolek, 57, cited about a dozen trips out of town with then-Bishop McCarrick, including a beach house purchased by the diocese in Sea Girt, New Jersey, a fishing camp in Eldred, New York, a small apartment on an upper floor of a hospital the prelate used for overnight stays in New York City, and one trip to Puerto Rico. Ciolek left the priesthood in 1988 to marry. Around 1999, he was called in by Msgr. Michael J. Alliegro, who had been then-Bishop McCarrick’s secretary in Metuchen. The monsignor, according to the Times, knew about the trips with seminarians and the bed-sharing. He asked Ciolek if he planned to sue the diocese. “And I literally laughed, and I said, no,” Mr. Ciolek told the newspaper, adding Msgr. Alliegro responded with a sigh of relief. By then, though, allegations the prelate, now an archbishop, had been circulating for five years, according to the Times. The paper said complaints were made to American bishops, the papal nuncio in Washington and, in 2008, to Pope Benedict XVI; Cardinal McCarrick had voted in the conclave that elected him three years prior. In 1987, according to the file examined by the Times, 1987, the second former priest said the prelate — by this time archbishop of Newark — took him to an Italian restaurant in New York City, and then to the small apartment above the hospital. The Times said the archbishop asked the seminarian to change into a striped sailor shirt and a pair of shorts he had on hand, and joined him in the bed. “He put his arms around me and wrapped his legs between mine,” said the account written by the ex-priest, who was still a seminarian at that time. In his 1994 letter to Cardinal McCarrick’s successor in Metuchen, Bishop Edward T. Hughes, the second priest said he believed the sexual and emotional abuse he endured from Cardinal McCarrick, as well as several other priests, “had left him so traumatized that it triggered him to touch two 15-year-old boys inappropriately,” the newspaper reported. Ten years later, that priest had been forced to resign under the U.S. church’s new zero-tolerance policy against child abuse, based on the admission in that letter. “The abuse of a minor by a priest — as is being reported in this case from New York — is an abomination and sickens and saddens us all,” he said. 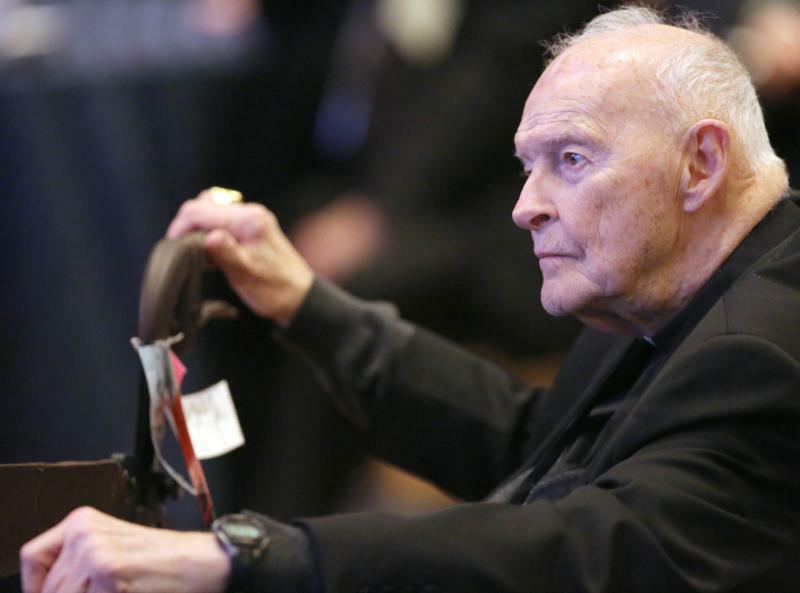 He acknowledged that allegations that Cardinal McCarrick engaged in sexual behavior with adults decades ago had led to settlements in two of those allegations. “The abuse of anyone who is vulnerable is both shameful and horrific,” Bishop Checchio said. How many in the heirarchy knew about (Cardinal McCarrick)? Every bishop should reveal what they knew or didn’t know. McCarrick should lose his red hat. He no longer deserves the title, Cardinal. He is no Prince.